Larry’s take on the weather here in England. I’ve been told that to be accepted by the British one has to complain about the weather. My father taught me that trying to understand the weather was preferable to complaining about it. Nevertheless I’ve found complaining about the weather in England is not optional – it’s compulsory! Dad worked for 40 years at a chemical plant in Texas that produced carbon black (soot basically) by burning crude oil and methane. Today carbon black remains a key ingredient in automobile tires (excuse me, tyres), plastics, dyes, etc. No need for a chemistry lesson here – elemental carbon is used in almost every product you buy. But the process of making carbon black is messy to say the least. Today chemical plants control their airborne emissions in compliance with strict government standards, but back in the 1950’s this wasn’t the case. Although filters were used at my Dad’s plant in the 50’s and 60’s, they weren’t adequate to prevent micron size particles of carbon filling the air above the plant. Depending upon the wind speed, direction, relative humidity, etc., very fine particles of carbon would settle on the farmhouses in the countryside surrounding the plant. Every day the plant manager would get a phone call from one or more farmers who felt they were getting more than their share of soot that day. The plant manager was mildly annoyed – my Dad was fascinated! Having only a 7th grade elementary school education, Dad maintained all the instrumentation used at this plant, mostly through self-study and trial and error. Since weather affected these instruments (many were unsheltered outside), so he also noticed that very local weather observations seem to coincide with heavier than normal soot fallout at certain neighboring farms. Having no weather station data closer than 30 miles away (and 24 hours behind), he decided to collect his own weather data using crude instruments he cobbled together in his shop. There were no computers or data-loggers in those days – wind speed, direction, relative humidity, and barometric pressure readings had to be collected manually several times a day. The eventual result was decades of weather data for that plant’s location that predicted quite accurately which of the surrounding farms was going to get “dumped on” that day. Dad could tell the plant manager in the morning which of the local farmers would be calling him that afternoon to complain. As the technology improved, so did my father’s enthusiasm for understanding what made the weather different from one day to the next. What does all that have to do with the weather in England, you ask? Apparently Dad’s decades of passion for understanding the weather rubbed off on his only son. I find the weather in England quite fascinating and definitely worth a bit of study. The United Kingdom straddles the geographic mid-latitudes between 49–60 N (51 N where I am). It is on the western seaboard of Eurasia (the world’s largest land mass) and the eastern edge of the northern Atlantic Ocean, warmed by the Gulf Stream. This month I’ve installed a Davis Weather Station at the top of an 18-foot pole in the back garden, which wirelessly transmits data to a console 75 feet away inside the house (where it’s warm and dry). Obviously it’s early times, but I’ve already observed hourly swings in barometric pressure that are amazing, measureable rainfall every day in January, and wind gusts of 17 to 22 miles per hour almost daily. Today we had blue skies at 12 noon, a driving rain from 12:20 to 12:45, and blue skies again at 1:00 pm. I’ve never seen clouds move across the sky the way they do here except with time-lapse photography. The good news is that the “bad weather” for this winter (snow & ice) hasn’t yet arrived. Maybe in February. Can’t hardly wait!! I have recently been watching a programme over here about compulsive cleaners. It has been fascinating. These people may have a disease, although to them they are perfectly normal! They feel the need to compulsively clean their houses, bodies, cars etc. for long periods of the day. Sometimes they don’t get on to anything else before they need to start cleaning again. They are obsessed with keeping everything as clean as it could possibly be and spend a lot of money and time on the products and hours it takes to get to perfection. The programme makers have coupled these people with their opposite numbers – those people who do no cleaning or very little cleaning or who consider cleaning to be the action of moving something from one place to another. They either cannot be bothered to clean up or they cannot face touching the dirt or they are in total denial of the fact that their houses or bodies are filthy dirty. Mostly, in the programme, it was the houses that were dirty, not the people. The compulsive cleaners were assigned the task of showing the objectors (those people who object to cleaning their space) how to best clean their houses and also how to de-clutter their space so as to make cleaning easier. In turn, the objectors helped the compulsive cleaners to see that there is a life beyond cleaning and they owe it to themselves and their families to be a little less discriminatory. Week by week I have watched the programme and marvelled at the outcomes. It really is a revelation. I consider myself to be normal in the respect of cleaning. I like a clean house, but I’m not obsessive about it. Bringing up three sons made sure of that! However I do see in myself a hint of the ‘strict’. I do like to do certain jobs on certain days and if I can’t keep to my routine, I find myself ‘outside of my comfort zone’ and feeling a bit anxious. I like to do my jobs in the mornings and then I can ‘play’ in the afternoons. I feel relaxed about picking up my knitting or sewing or spinning or whatever, once the chores are done, but not before! Having watched the programme for a few weeks, I began to realise that some of the people on the receiving end of the show really did not know how to clean. Amazing! I was brought up in the 1950’s when mums mostly stayed at home to take care of the family here in England so I was able to observe at first hand how to keep a house clean, how to do the ironing, cooking etc. My mother was a good role model so I became a clone of her, I suppose. I have very fond memories of growing up with a mum at home all the time and when I had my own family, I wanted to do the same. I managed it although it did take make sacrifices. You can watch the programme yourself here: although it may not work in America (sorry). Hoarding clutter and not being able to throw things away is very similar to avoiding cleaning the home, it seems to me. Hoarding possessions seems to be a way of not letting go of the past and I am guilty of that myself, to a certain extent. I’ll go into this in more depth in another post. Suffice to say that watching these programmes has made me aware of how things can overcome us and eventually leave us needing help, from family or friends or even ‘the compulsive obsessive cleaner round the corner’. A while ago I included a category on this blog, entitled ‘Daily Chores’. I’m working on this from time to time. I started it when I came to realise that a lot of people just have no idea how to go about keeping their place clean. What it says about me is that I place a lot of importance on these issues. To me, a tidy, clean place gives rise to a tidy, clean mind. Does that sound pompous to you or just common sense. Do you agree or disagree? Have you seen the programme? or one like it? What impression did it make on you? Are you a compulsive cleaner or a hoarder or maybe you can’t face cleaning your home? Please tell me, I’d love to know. I just finished this book the other day. It was fabulous. Funny how some books capture your imagination and others don’t. That’s why it is difficult to recommend because I always feel like ‘well, I liked it, but maybe they won’t’. However, this book is so good and I’m not alone in feeling that, that I have no hesitation in recommending it. It is impossible to review it in depth without giving the story away so all I will say about that is that it is all about a lighthouse keeper and his wife who live on a tiny island beneath the lighthouse off the western coast of Australia. One day a boat drifts on to their shore. In the boat is the dead body of a man and a tiny 2 month old baby. What happens next you must read for yourself. I think you will find the book hard to put down. 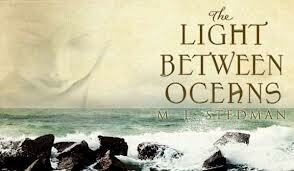 The authoress is M. L. Stedman and it is her first novel, published in July 2012. For a first novel or even a subsequent one, it is stupendous. Why? because I couldn’t put it down. Not a word is wasted and yet her descriptions are thorough and the characters are very well drawn. Be warned – it is a heartbreaking story so you’ll probably need the tissues. I did and when the book was finished, I was left with that empty feeling that only comes at the end of great story. I’m told a film is coming so be quick and read the book first because they’re always better than the films, right? Baby Sam’s First Christmas and a new project for me. This is my second grandson, Sam. 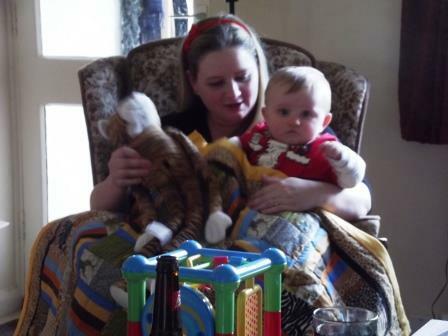 He is sitting on his mum’s lap, opening his Christmas presents. 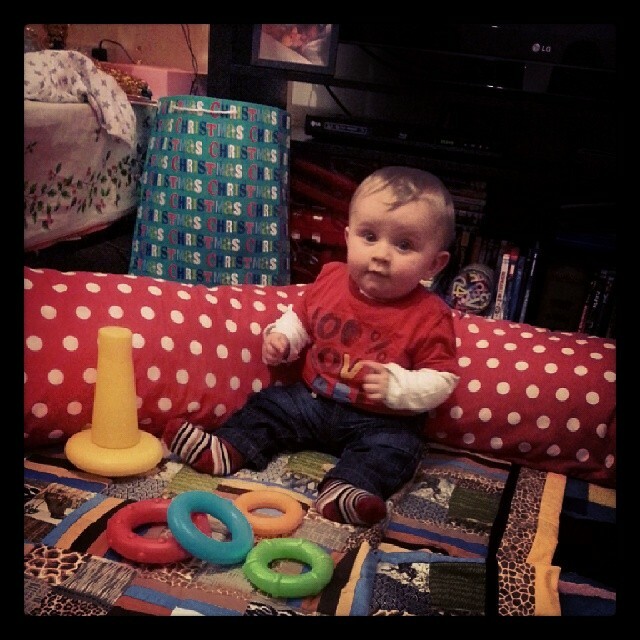 He is a little confused about it all because it is his very first Christmas and he’s not sure what it’s all about. The quilt over his knees was his main present from me. You can see more about it here… I think he likes it. It has a jungle theme so I bought him a tiger to go with it and a storybook called ‘The Tiger Who Came to Tea’. Don’t you just wish you were that age again? I love the spooky nature of the Primitive Style. It appeals to that side of me as I love all things natural and home-made. 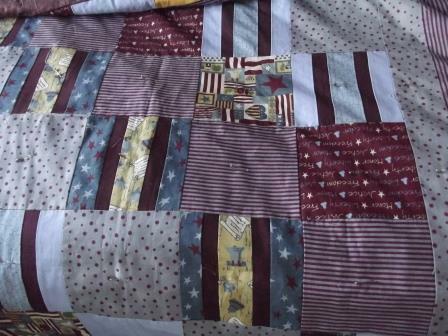 Here’s a preview of Larry’s quilt, which I still have to sew up. 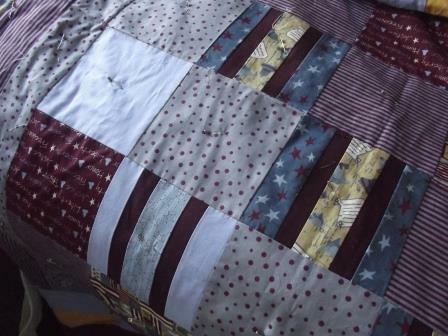 The layers are in place like a sandwich and I’m pinning them together so they don’t shift about when I sew. Millie is my six year old calico cat. 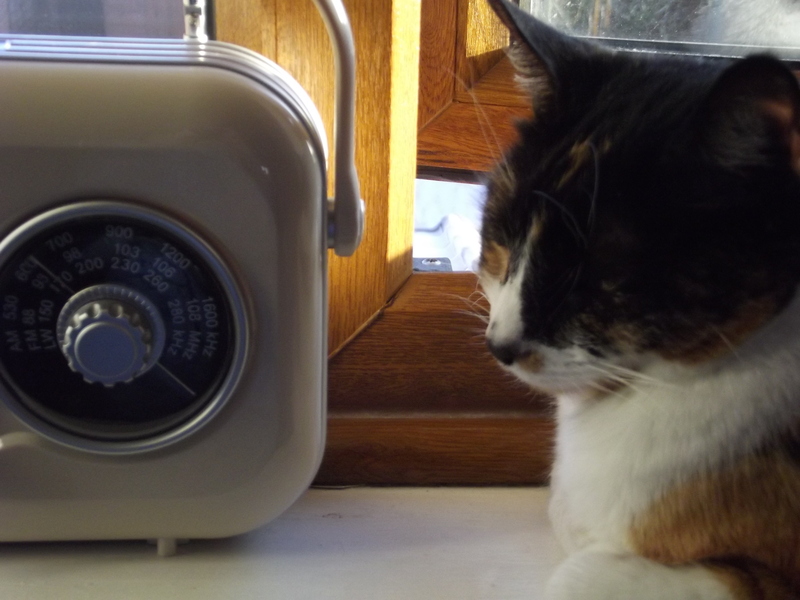 She likes to sit on the window sill and listen to the radio. Isn’t that cute? Since the New Year began, we’ve had so much rain and high winds, that it’s been difficult to get out much. I don’t know about you, but I’ve become a bit lazy! I enjoyed Christmas a lot and got used to the routine of eating what I fancied and slouching around watching lovely cosy films on TV. I’m in the fortunate position of not having to go back to work because I’m retired so at long last, I can enjoy life without worrying about that annual return to the workplace. I do miss my jobs, but I love being at home so much that the days just fly by. 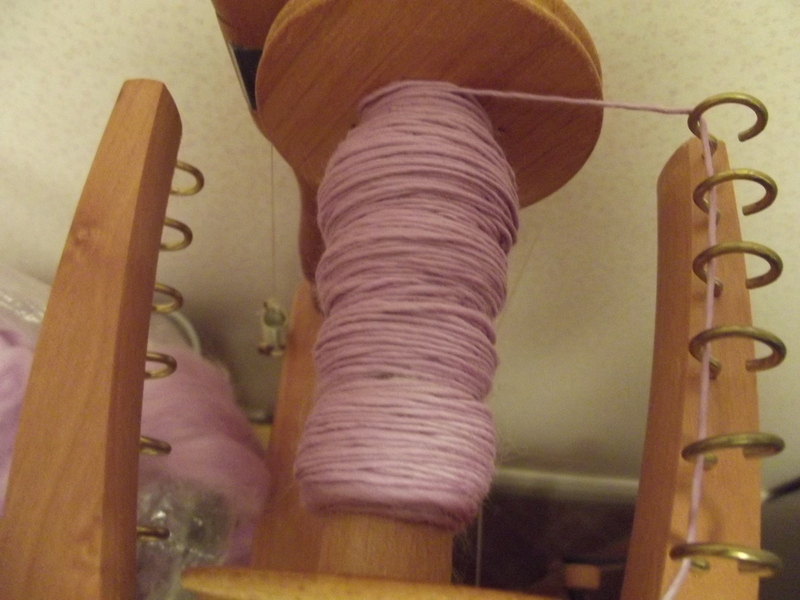 I’ve been spinning. 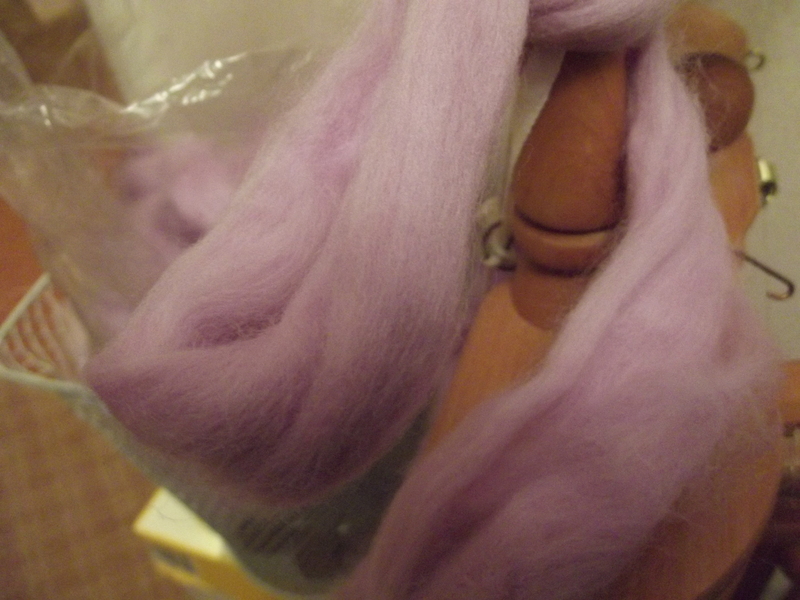 This is my latest spinning project: a lovely lavender roving in Merino, which is a delight to spin with and will be fun to knit with later on. Have you got any new aims for 2014? I don’t make resolutions, but I do have aims. This year’s aim is to study the Druids. In my Wiccan world I try to study something different every year so that gradually I get more knowledgeable as the years go by. The Druids have always fascinated me so I look forward to reading more about them and perhaps sharing some of it with you. I so enjoy blogging with all of you. I’m looking forward to following you through this New Year and trust that it will be a good one for all of you. ‘Five Months in England – Still learning! Driving in the UK remains somewhat of an uncertainty. I plan on taking driving lessons in the spring – that is, if they will let an old man of 69 years drive over here. Not that I don’t know how to drive a car – been doing that for half a century now! No, it’s this business of having the car on the wrong side of me and the gear shift on the wrong side of me and the road on the wrong side of me…. Well, you get the picture. It’s a bit like trying to read a book by viewing it in a mirror. Seems simple enough to decipher a sentence or two as a party trick, but imagine having to read the entire book that way, and in heavy traffic. I just need a bit of practice to gain some confidence, and a driving lesson or two seems the safest way to proceed. Might even be a nice break for the driving instructor, not having to worry about a gum chewing 16 year-old slamming on the brakes every 100 yards to answer a text from their friends. Hopefully I’ll get an instructor who can adjust to my Tennessee vocabulary, such as ‘rite thar’, which means ‘look whar my finger’s pointin’. Having a senior citizen’s pass to ride the bus for free makes driving a luxury rather than a necessity. But that isn’t the point. I see it as a challenge, and I’m still up for a challenge even at my age. Learning the ‘rules of the road’ in the UK, albeit substantially different from those in America, is not the challenging part. I recall my 7th grade English grammar teacher explaining to a group of 13 year-olds that it would take us two weeks to learn the rules of proper English grammar, followed by another 16 weeks to understand all the exceptions. The exceptions were the interesting bit – so it appears to be with driving in the UK. Take, for example, a leisurely drive through a suburban area of a southeastern English town. In England we are supposed to drive on the left side of the road. Simple enough, but here come the exceptions. At least half the cars in the UK are parked in the road (they have no other choice), some partly on the curb and some completely in the road blocking the left lane entirely. So if you’re trying to drive on that road what do you do? You toss the rulebook out the window and improvise. You drive on the right lane (natural for me) until you get around the obstacle. Unless….. There’s a car coming toward you in the right lane. That means waiting until he has passed, and then moving into the right lane. Unless….. You think you may have ‘just enough time’ to swerve around the car blocking your lane and get back in your lane before the oncoming vehicle arrives. This is where it gets interesting. Different drivers have different perceptions of how much is ‘just enough time’. City bus drivers seem to be experts at this little game of “chicken”, having played it once every 3 minutes throughout their career as a bus driver, based on my 5 months of observations. I used to think that most of the traffic congestion in America, caused primarily by 4-way stop signs, was successfully eliminated in the UK by building roundabouts. These ingenious inventions keep the traffic moving because it is much easier to determine whose turn it is to safely proceed through the intersection, i.e., you don’t go through the intersection – you go around it (and each other if there’s sufficient space). However, I have since discovered that whatever time savings the roundabouts offer is cancelled out by the time spent sitting behind parked cars blocking the left lane, where ‘whose turn it is’ depends on people’s perception of ‘just enough time’. How big the oncoming vehicle happens to be is also worth considering, with city busses getting preferential treatment from most motorists. Out on the motorways (highways) things get a bit more dicey at much higher speeds. Motorways in the UK are usually a welcome relief from the relatively narrow (curb to curb) streets in and around towns. Motorways may be wide enough (using the entire paved surface) for three car widths, sometimes wider still. Thus driving in the left lane offers some new options. If trapped behind a slow moving lorry (truck), some drivers wait until there is sufficient space in the right lane to pass the lorry before the next oncoming vehicle arrives. This is the familiar custom on American highways. In either country success also depends on how much horsepower you have under the hood (excuse me, bonnet). But in the UK you may choose to go down the middle, passing the lorry on its right side but staying sufficiently out of the right lane that the oncoming vehicle can comfortably (or uncomfortably) go whizzing by. This is an interesting thing to watch – a lorry at 60 mph being passed simultaneously by a BMW going 75 mph in the same direction and a Fiat coming at 70 mph in the opposite direction. Definitely not for the faint of heart!! Other options too complicated to describe here must surely be available when the motorway offers multiple lanes in each direction.